Pour milk into a 12 oz. glass. Fill glass with carbonated water from the iSi Soda Siphon so that the white foam reaches the top of glass. Place spoon in glass. Pour chocolate syrup into glass, taking care to hit the spoon while pouring. Stir drink quickly, mixing the syrup with milk without deflating the foam. Serve immediately. Top with whipped cream from iSi Cream Whipper if you’d like. 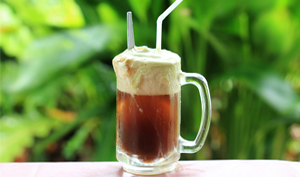 To make an Italian Cream Soda, float 1 oz. of half and half on top before adding whipped cream. Pour syrup into 12 oz. glass. Add ice cream. Fill with carbonated water from the iSi Soda Siphon and stir to blend syrup and water. Top with fresh whipped cream from an IsI Whipped Cream Maker.